There was one DRO challenge that, at first, GEDICO could not seem to find a solution for. Their largest capacity lathe, a Niles VTL, has a massive 144” x 120” capacity. Installing DRO linear scales on the X (cross travel) and Z (up and down) axes on most VTL’s is no problem. Installing a linear scale requires that of the 2 main components – the scale and the read head – one travels along with the moving axis, and the other stays stationary. However, on this Niles VTL, there was no obvious way to mount the Z (up and down) axes scale on the ram of the machine. Don Smith called in Mike Kilroy of The Mike Kilroy Company to help find a solution.The Mike Kilroy Company provides synergistic technical sales and support of the state of the art motion control products they represent. Kilroy has represented and assisted in engineering in Newall linear encoders for motion control and DRO applications for several years. After a quick assessment of the Niles VTL, Kilroy asked Don Smith of GEDICO “is the ram of the machine hollow, or solid?” The ram in fact has a 3” cored hole through the center. The unique design of the Newall Spherosyn linear scale allowed Kilroy to provide a solution, as pictured. The Spherosyn scale requires no backer bar, spar or machined surface. The only component requiring precision alignment is the read head, which slides over the .600” diameter scale (tube.) The scale requires no indication or flat surface. That means Newall Spherosyn scales can be mounted in much less time, almost half the time, of any other type of linear scale. 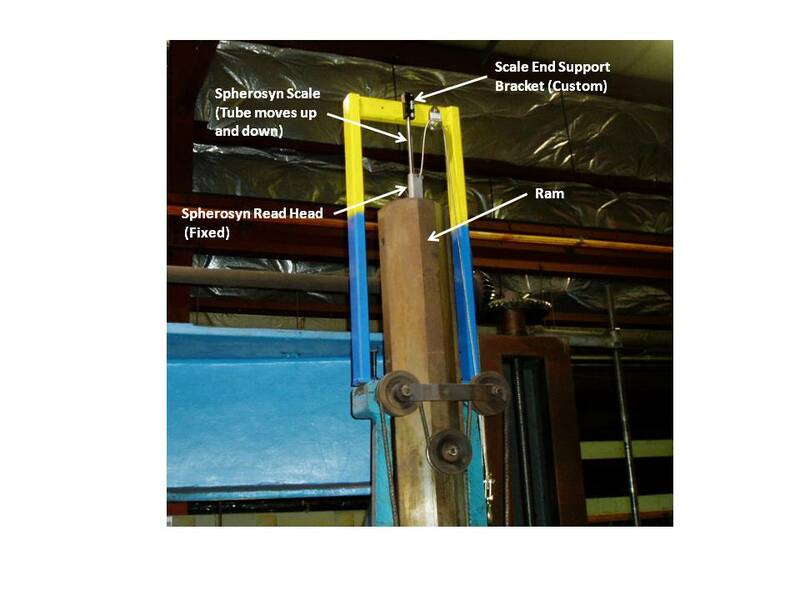 Vertically mounted Spherosyn scales only have to be fixed at one end of the scale (tube.) This allows Newall Spherosyn and Microsyn linear scales to be mounted in places where no other linear scale can be mounted, and provided the solution for GEDICO (along with some intuitive thinking by The Kilroy Company,) enabling them to enjoy the DRO benefits on both axes of their large capacity Niles VTL.